My first stop in London was Topshop. I went straight ahead to makeup area and picked up some wonderful products. Topshop lipstick range was just overbearing with color choices so I had a hard time to decide, especially since we were in a hurry. Oh La La stood out to me the most. Ohh La La is a classic peach mix of somewhat neon and pastel orange. Still it has a pink undertone to make it more wearable. Directly from the tube it looks pretty bold and straight neon orange yet it transfers more pastel than you would have expected on first glance. In terms of pigmentation I can't say other than they deliver high pigmentation. I also believe they come in different finishes, Oh La La is part of velvet finish but I would prefer to categorise it as a cream finish. Longevity is good, lasts about 5 hours before needed touch up. Ohh La La doesn't survive eating nor drinking. It's comfortable on the lips and doesn't dry them out after a day of wear. Other than that, I have to praise their white matte packaging with black stripes - super adorable, unique and modern. For the price you just can't go wrong and I'm sure everyone can find a perfect match. One thing did bother me a little bit and that's color range. As I've said it's pretty huge but there's a lot of dupable colors, especially from the Mac counter. Just keep in mind your current lipstick collection when choosing a color if you don't want any unnecessary duplicates. 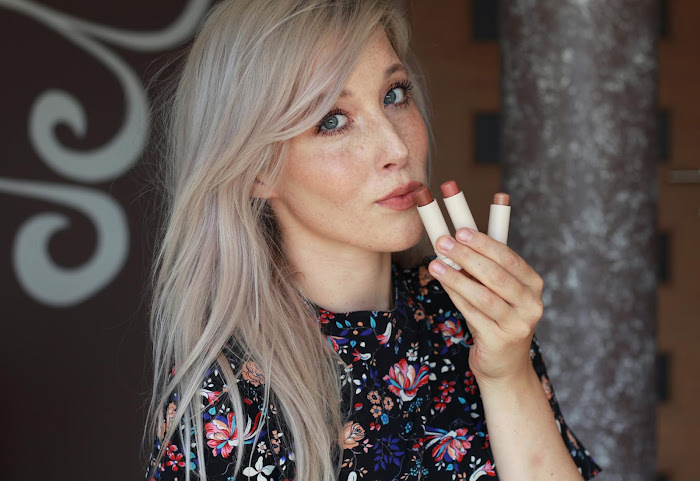 Ohh La La is in particular very similar to YSL #30 Faubourg Peach but slightly darker. Bourjois Color Boost Crayon Peach on the Beach is pretty much a dupe but less pigmented and more glossy. Nyx India is way too light to do proper comparison. 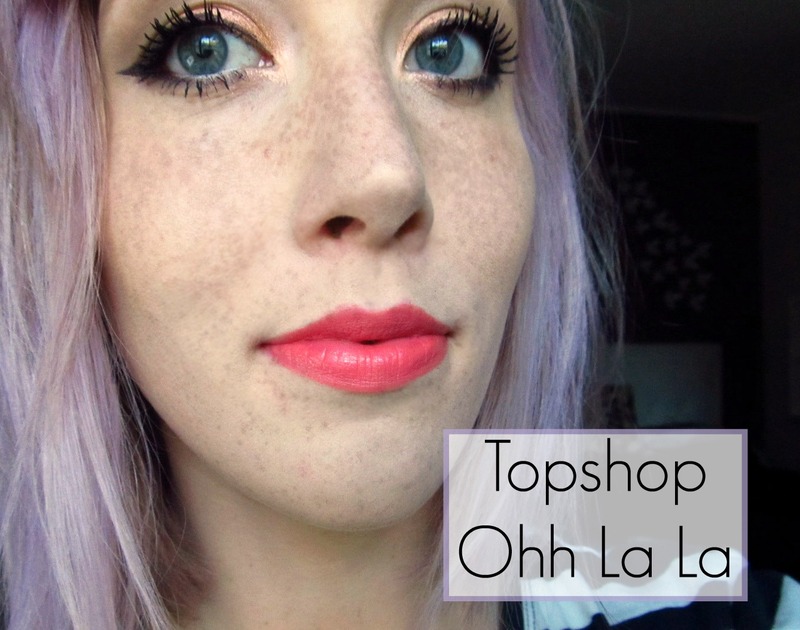 I encourage you to take a look at Topshop lipstick range, you'll be surprised by their quality. For 8 GBP they're not the cheapest choice on the market but you sure won't be disappointed. Just rethink the color you're choosing, it's possible you'll find a similar color in your already existing collection. 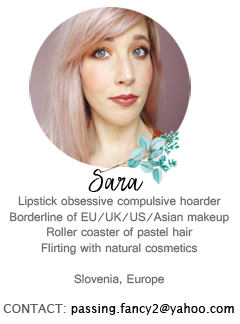 You can find Topshop makeup also on their online store with worldwide shipping. 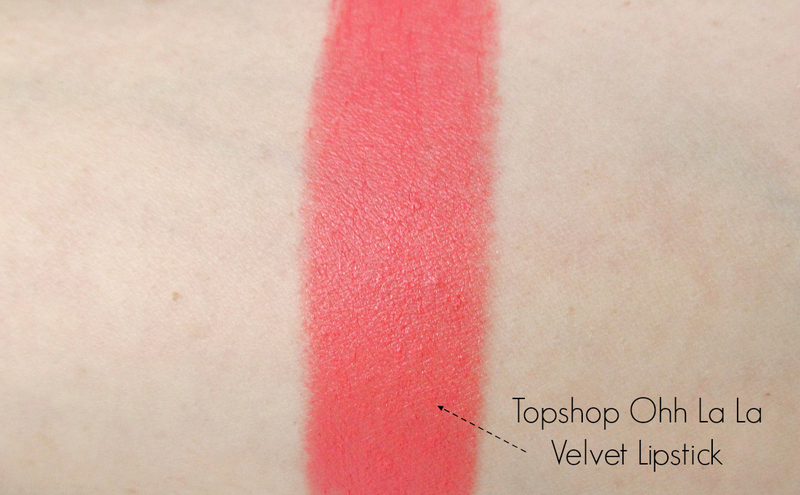 Currently, Topshop lipsticks are 2 for 12GBP which is a pretty good bargain for Topshop. Of course, our one and only Topshop in Slovenia doesn't carry makeup line. Ohh La La looks really good on you and I think it also matches your hair colour. Is that jumper from Topshop as well? It is sooo cuteeee <3. Zelo lep odtenek in zelo ti paše:) Zame mogoče preveč na roza vleče, ampak je res zanimiv odtenek:). I've been eyeing this shade in particular! It's so stunning! Love the way it looks on you especially!